Wales is ready to host a major Davis Cup tie in Cardiff, says Tennis Wales chief executive Peter Drew. He told BBC Wales Sport that Cardiff's Millennium Stadium was due to host the final if Great Britain had been at home against possible opponents Argentina. Britain beat hosts Belgium - who overcame Argentina in the semi-finals - to seal a first title since 1936. "It would have been absolutely amazing for Welsh tennis. Unfortunately not to be, it just slipped away," Drew said. "But it's great that the Lawn Tennis Association were looking at the Millennium Stadium to host the final if it was in Britain and that it's now on the radar for future opportunities for a major Davis Cup tie to be played in Cardiff. "When the semi-finals were being played back in September, if Argentina had won instead of Belgium then the final would have been held in the Millennium Stadium." November's final was held in Belgium because Davis Cup rules mean teams alternate home and away ties against specific opponents. "Hosting a major tennis tournament in Cardiff is an exciting prospect and something that could certainly be delivered at the Millennium Stadium. We're a multi-purpose venue with the flexibility to host a range of indoor and outdoor sports. "The stadium's history includes World Championship motorsports, Power Cricket and boxing across over 400 major events. Since the stadium first opened in 1999, there's always been a positive 'can do' attitude to take on the new and exciting challenges of any major event. We're always in the market to attract the biggest and best events to Wales." A world record tennis crowd? Drew revealed Wales' plan for a Davis Cup tie could have seen a new world-record crowd for a tennis match, with over 30,000 spectators. "It's difficult to visualise," he continued. 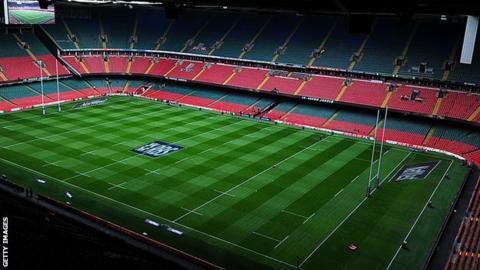 "How do you put a tennis match in the Millennium Stadium? "How it was going to be put together was to have the court right in the middle of the pitch, with almost a stadium within a stadium built around it, with some pretty close-up viewing but then using the seating along the sides of the main stadium." When will it be Wales' turn? Birmingham's 9,000-seater Barclaycard Arena will host Britain's next Davis Cup tie when the defending champions host Japan in the first round of the 2016 competition. "You don't know who you're going to be playing until quite short notice and then you don't know whether you're going to be hosting that match or playing away, so it's something that needs to be planned in a short space of time," Drew explained. "We were trying to do it earlier this year and we couldn't do it because the Rugby World Cup took the Millennium stadium out for the (Davis Cup) semi-final, so it's just a matter of the right time and place for things to come together." Since the victory in Ghent, Britain's number one Andy Murray has said talking to the LTA about the future of British tennis is a waste of time and ex-player David Lloyd has called the organisation "a mess". "The LTA I think would admit that, in the past, they haven't always got things right," Drew responded. "I know they're doing a big piece of research work and consultation work across Britain at the moment to try and look at what's the best way they can support up-and-coming young players. It's a difficult one. There's no right or wrong way of trying to bring through these talented youngsters. "Hopefully children and adults across Wales will have been watching that and being inspired. "The LTA has been doing a lot in the lead-up to the Davis Cup and afterwards. They've sent out promotional information for people to spread around their club and local community. "We're working with the clubs and the centres to really encourage them to get into the schools. The clubs and centres need to connect with the schools and really maximise those opportunities." When will a Welsh player reach Britain's senior Davis Cup team? At Wimbledon, Rebecca Llewellyn's 6-0, 6-1 first-round loss to Russian Svetlana Kuznetsova in 2005 is the only appearance by a Welsh senior player in the main draw at the Championships in the last 23 years. But could that change soon? Currently ranked 357th in the world, Joshua Milton is Wales' best-performing male tennis player and is ranked 10th in Britain. "We've got some good players coming through in Wales," said Drew continued. "Our top players Josh Milton and Evan Hoyt both had their best years on the professional circuit. "Certainly they're not anywhere near in contention for playing in the Davis Cup team at the moment, but they've both had extremely good years. "This year we had Matt Story who the won the British junior doubles title, while Ricky Tong was ranked number one in Britain in the Under-18s last year. "So we've got some good players coming through. Whether we're going to have a player in the Davis cup squad, that's probably a little bit further down the track."